Bring your coconut oil to room temperature (or warmer than 75 degrees) - naturally or by placing the 1/2 cup of coconut oil in another cup full of hot water until the coconut oil melts. Blend the liquid coconut oil, cacao powder, essentail oil, vanilla, and honey until smooth. Pour into heart molds or drop small dollops on wax paper. Freeze until solid. Enjoy! In a food processor, chop almonds until fine. Add raisins (or dates) and continue to grind until a fine crumble is achieved. Press into pie pan (springform works best!). In a blender, blend remaining ingredients until smooth. Pour onto crust in pie pan. Freeze until solid. Decorate with fresh strawberries after frozen. Slice to serve while frozen and let thaw for a few minutes before serving. Enjoy! In a food processor, with an “s” blade, grind sunflower seeds until fine. Add dates and apricots and process until a crumble has formed. Add the apple and nutmeg and continue to process until a sticky ball of dough has formed. Take a big pinch of dough, roll it into a ball and place it into a container. Place in the fridge to firm up. Eat when firm and enjoy! Blend bananas and strawberries. Transfer to a bowl and stir in Chia Seeds. ​Wait 10 minutes and stir again. Enjoy! Open the pomegranate – check here if you are unsure how to do that – and place jewels into bowl. Dice your apples into itty bitty pieces and place into bowl as well. 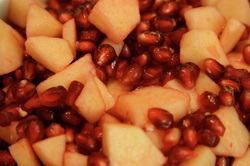 Juice that lemon and sprinkle over the apples and pom jewels. Enjoy!!! 1. Sprinkle cinnamon on top, mix with some honey and it’s a wonderful pie filling. Add a raw pie crust, and voila! 2. Place on a bed of spinach for a delicious and sweet salad. 3. Add to your morning granola or yogurt.